A laser-based microscope video imaging technique has revealed why a particular cancer drug is so effective at killing cells. The findings could revolutionize the design of future cancer treatments. Using high-quality video imaging, researchers from the Manchester Collaborative Centre for Inflammation Research (MCCIR) captured the process in which rituximab – a drug widely used to treat B cell malignancies such as lymphoma, leukemia and rheumatoid arthritis – binds to a diseased cell, then attracts white blood cells known as natural killer cells to attack. The investigators found that rituximab tended to stick to one side of the cancer cell, forming a cap and drawing a number of proteins over to that side. The drug effectively created a front and back to the cell – with a cluster of protein molecules massed on one side. But what surprised the scientists most was how this changed the effectiveness of natural killer cells in destroying diseased cells. When the killer cell latched onto the rituximab cap on the B cell, it had an 80 percent success rate at killing the cell; when the B cell lacked this cluster of proteins, however, it was killed only 40 percent of the time. Shown are cancerous B cells with the protein drawn to one side. The protein is highlighted in green. Courtesy of professor Daniel Davis, University of Manchester. Most of the research – done in collaboration with MedImmune, the global biologics R&D arm of AstraZeneca – was completed while Davis was at Imperial College London. He plans to continue using high-quality video imaging at a microscopic level to investigate immunology at MCCIR, a collaboration between the University of Manchester, GlaxoSmithKline and AstraZeneca. The research was supported by the Medical Research Council and appeared in Blood (doi: 10.1182/blood-2013-02-482570). Technique using functional optical microscope with the addition of a coherent source collinear with the image path. The laser light is intended to scan the sampled plane and acquire information from fluorescence of the observed ample. Confocal laser microscopy uses this technique. 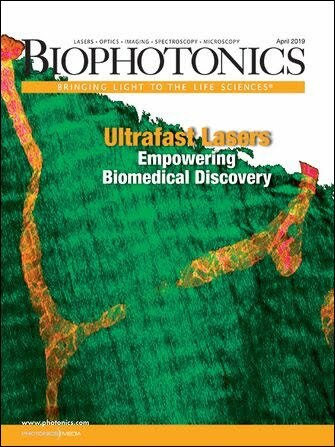 Newport Thin Film Laboratory Inc.
x Subscribe to BioPhotonics magazine - FREE!